Pre Italia’90, the worlds of music and England’s national football team had not so much clashed as gently bumped into each other to the sound of men in blazers struggling to sing a chorus. While a song to mark an international tournament was a good idea in principal, we were six years away from a goose-bumped Wembley singing “it’s coming home” and perhaps more pertinently, we were only two years on from a car crash of Stock, Aitken and Waterman’s making by the name of ‘All the Way’. That single’s performance had rather fittingly run in line with the team’s dismal showing at Euro’88, ‘peaking’ in the charts at number 64. If nothing else ‘All the Way’ represented a desire to at least try to create a song that mirrored a path popular music was taking at the time. Before 1988 most World Cup and European Championship songs had beaten a well-trodden trail - low register, steady tempo numbers with uplifting lyrics about how we’d be thinking about them while they were far away or this time, more than any other time, they were going to find a way. After a dismal performance with Mexico’86’s ‘We’ve Got The Whole World at Our Feet’, it seemed the non-top-40-troubling Euro’88 effort had nailed the coffin shut. On top of the desperately uncool image of the football song there was also a wider problem to consider. By 1989 dance culture had emerged. Intrinsically linked with a drug scene that was being fuelled by ecstasy and LSD, huge and in most cases illegal raves were being held predominantly around London but spreading across the country fast. A widespread vilification in the media only fuelled the desire of a disenchanted youth and 80s synth and electronica evolved into piano riffs and smiley faces. Whereas punk had been about snarling against authority and electronica had made music the realm of the outsider, this new culture was about letting go and enjoying yourself after a decade of unemployment, strikes and widespread depression. Traditional guitar bands were also evolving and a hybrid was emerging with names like the Stone Roses and the Happy Mondays at the fore. With the need to reflect the general public’s move to something happier angst-ridden rock, high-energy punk and heavy metal were being pushed out of the charts. Working class roots were being celebrated over middle-class melancholy, the Happy Mondays in particular finding themselves just as likely to be celebrated in a huge tent populated by dance music fans as the more traditional indie venues. Manchester became ‘Madchester’, the unofficial capital of a countrywide movement and a genuine rival for London in terms of cultural influence. If they wanted to plug into the zeitgeist a radically different approach was required. The FA needed to find a band willing to write England a song that captured the mood of nation. This was coupled with the prospect of getting them to buy into what was perhaps seen as the most ‘uncool’ project you could imagine. Decisions on the process were moved away from the old guard and the FA’s press officer, David Bloomfield, took a lead role. Knowing how difficult the task ahead could be he knew there was one man who would not bat an eyelid at the challenge - he would relish it as it in turn fed his ego. In short, England needed Tony Wilson. Wilson may not have been solely responsible for Madchester’s emergence but he was there at birth and had played a huge part in nurturing it through to its glorious teenage rebellion. A Granada television presenter and local newsreader by day, Anthony Howard Wilson was a man of two lives. By night he fronted several regional arts and music shows to greater and lesser degrees of success but more importantly, he remained founder, co-owner and manager of Factory Records - home to several of the most influential bands around including the all-conquering Happy Mondays. He was also co-owner and manager of, and regular in for that matter, the Fac 51 Haçienda nightclub. The venue had been at the forefront of the changing face of live music and one of the first to embrace and promote nights devoted to dance. So with Wilson predictably and very much on board, the next big obstacle would be convincing Bloomfield’s preferred choice of band – Factory Records’ own New Order. As a fan he hoped they would go for it despite Wilson pointing out immediately that not one member of New Order was actually interested in football. With the band’s notoriously prickly attitude, pushing them into something they weren’t interested in looked like wishful thinking in the extreme. By the end of the ‘80s New Order had found a dance inspired sound and were enjoying huge success. The single ‘Blue Monday’ had become the biggest selling 12-inch vinyl in UK history and they were now filling arenas. By the end of the decade they were Factory’s old hands, a huge source of revenue for the company and close friends with the label’s management. They were also all investors and part-owners of the Haçienda which had grown to become a key live music venue, showcasing everything from Madonna’s first televised appearance on Channel Four’s ‘The Tube’ to taking the decision to hold nights devoted to house and dance music - the DJ taking the plaudits where once a live band would have played. Internally their relationships were strained after over a decade of performing and recording together but as a band, New Order’s credentials within the industry had never been higher and their music, particularly when played live, was becoming a standard for others to look to. Their latest album ‘Technique’ had been released in the February of 1989 and had debuted in the album chart at number one and to huge critical acclaim. A football song in collaboration with the FA? No chance. Having talked with Wilson at length the FA agreed that if New Order took the project they would have free rein and full backing, the only instruction being that the song had to distance itself as far as was humanly possible from any hint or reference to the current hooligan culture that blighted the national team’s travels abroad. It still seemed unrealistic that the band would go for it, however, despite initially all agreeing it was an awful idea they were persuaded by Wilson to at least thrash about some suggestions as to how they would approach it if forced. Bills at the Haçienda (now co-owned by New Order themselves) were mounting fast and at one point it’s been suggested by bassist Peter Hook that the club would go on to owe each band member over £1m each. While not at this point yet, if nothing else the song could provide some much needed capital and another way to feed people into the band’s back catalogue. From this point of view alone Tony Wilson was now hugely enthusiastic doing about the song, realising the potential for all parties to not only create something radically different, but also the commercial value in producing what would have been in effect, the first ‘good’ football song. At first the band agreed it was an impossible task - after all this was New Order and a world where groups of footballers gathered on stage to record the least challenging vocal arrangement possible was not something that existed in the same stratosphere as their now Balearic and Acid House inspired sound. Slowly and to everyone’s stark surprise though, against the odds a song began to will itself into existence. Band members Morris and Gillian Gilbert had composed some music for a BBC youth programme titled ‘Reportage’. One rhythm had stuck with them. As a band they elaborated on this initial idea and eventually had the genesis of a full song. With the band now at least mildly interested if only for the ease with which they found themselves with new material for once, they were now faced with the most difficult part of the whole process – trying to create a set of lyrics that referenced the game in a way that didn’t completely jar with the spirit of the song. In short they had to find a way to take singing about football away from the chanting and supposed thuggery of the terraces, and into a studio without sounding forced or crowbarred. Speaking to ‘Four Four Two’ in 2010, Morris admitted it was a “nightmare” coming up with the lyrics. Taking their cue from the FA’s edict that there should be no way to draw a line between this and any sort of football violence, the band wanted to create something incredibly positive that transcended the game. Knowingly though, they also wanted something tongue-in-cheek enough so that as Morris admitted in “if it all went pear-shaped, at least we could say it was a joke”. Having struggled with the words for long enough it was decided help was needed from a friend of the band and Haçienda regular, actor and comedian Keith Allen, who leapt at the chance to get involved. Unsurprisingly the lines were rejected, drug allusions aside it was a clumsy verse that clunked even more when sung. With that put to one side the lyrics were eventually completed, Allen’s Loki taking charge of things according to Morris in the same Four Four Two article like “an evil puppeteer”. In subsequent interviews Allen has claimed more than once that the line ‘it’s one on one’ was a far more subtle way to reference the growing drug culture as it has its heart in the phrase ‘”are you on one?” Whether it truly was as intended is debatable but with Allen, New Order, Tony Wilson, producer Stephen Hague and the FA representatives present reasonably happy with their creation, it was left to be tinkered with until such time as the players could be taken to a recording studio to perform some limited backing vocals and the most daring aspect of the song - the rap. Space in the melody had been created but Allen had yet to finalise his lyrics for the rap or indeed, who would perform it. A few weeks after the initial recording at Peter Gabriel’s place the band and Allen were summoned to another member of rock royalty’s studio. Led Zeppelin’s Jimmy Page had a place just outside Henley that was chosen as the venue the team would come and perform. Everything was still a bit confused and certain things were very much up in the air dependent on where the day may take them. The rap needed work and the song had been rearranged leaving the existing lyrics requiring adjustment to help them scan better. On top of that the players arrived with exactly the same attitude the band had first adopted - that this couldn’t work and was a waste of time. They were also very much on the clock as despite all receiving £1000 in cash for their time, they also had a shop to open later in the day. Six arrived at the studio and it was now over to Steve McMahon, Des Walker, Chris Waddle, John Barnes, Paul Gascoigne and Peter Beardsley to perform. Making up the numbers was Liverpool’s Craig Johnston, Australian by birth and a man who whose career post football would perhaps truly define his major contribution to the game. Johnston had been the first Australian player to really make an impact in English football, moving to Liverpool from Middlesbrough in 1981 and falling in love with the area. After 271 appearances for the club he had retired in 1988 due to a desire to return to Australia to care for his ill sister but not before he had his first brush with the music world, co-writing ‘The Anfield Rap’ with rapper Derek B for the club’s FA Cup final appearance the same year. Johnston had taken the initiative by seeking out the rapper and working with him to devise the simple verses that, amongst others, John Barnes would perform. He even claims to have gone on to direct the video for the song which hit number three in the charts at its peak. His post football career has been extraordinary when compared to most. In later life he would become a music producer, devise a successful prime-time television game show, invent a system for tracking purchases through a mini-bar, become a full time photographer with exhibitions in America and London as well as commissions by Tag Heuer and Sotheby’s, and perhaps his biggest legacy was his five years spent researching, developing and eventually selling the concept that would become the Predator boot for Adidas. The increased grip was one of the biggest innovations in football apparel for years and having been rejected by nearly every major sportswear company in the world, it was only Johnston’s tenacity that finally made someone listen. His contribution on the day of recording turned out to be no less creative, devising the line in the rap ‘we ain’t no hooligans, this ain’t a football song’ which fitted perfectly with the sensibilities of both the FA and New Order. The day began awkwardly for everyone involved. Speaking to the NME in 2010, lead guitarist and vocalist Bernard Sumner recalled that he’d spent the night before at a gig with 808 State and was “throwing up in a bin” as the team arrived. In Allen’s autobiography he suggests that Sumner’s illness was a result of the “two massive lines of coke” they’d had in his hotel room before being driven to the studio by Wilson, a substance both continued to imbibe throughout the day. Allen and the band were not the only people there with vices and the England team held up their end by drinking the studio fridge dry of champagne, Gazza himself reportedly drinking three bottles on his own without ever finding the need for a glass. With their chosen poisons now adding to the creative process work began, the rap turning into a collaborative effort between the band, the players, Allen, Johnston, Wilson and representatives of the FA. With the content of the song’s crowning glory decided only one thing question remained – who would perform it? According to Allen the original plan had been to have them either all record it together in a more ‘sung’ style or to take a line each. In reference to this the B-side (in a nod to the game simply titled ‘The B-Side’) was a remixed version of the original that does contain a shorter version with each line taken on by a member of the team. On the day with only five of the team there and with so much drink taken, it became obvious neither direction was going to work. The only thing left to do was to give them all a go individually at performing it in full. Peter Beardsley struggled, Steve McMahon and Des Walker couldn’t keep the required rhythm. An excited Gazza kept time perfectly but could barely be understood under a heavy accent enhanced by the booze. With just Chris Waddle and John Barnes left to have a go the microphone was passed to Barnes first. Barnes stayed on time, was clear and had the accent to compliment the line’s rhythm without ever making it sound forced. Waddle never had his go as they had found their man and it proved to be the right choice as within days of its release, people across the country found themselves pretending to be John Barnes with a hairbrush in front of the mirror instead of a ball at their feet. With the song that had once seemed impossible nearly completed, all parties listened to the finished piece. Against all the odds Tony Wilson had convinced New Order to agree to produce a World Cup song with a comedian writing lyrics and a footballer rapping on it. Even further against the odds everyone realised very quickly that it not only stood on its own as a piece of music, it really was good on every required level. Take the World Cup and the football away and it still held its own. David Bloomfield’s original mission impossible had been accomplished. The song was now mixed to the perceived point of perfection. Allen convinced Kenneth Wolstonholme to re-record his famous ‘they think it’s all over…it is now’ for the song’s opening as the original was both bogged down by litigious copyright and not a perfect fit as was. Also a couple of samples were taken from ‘Goal!’, the official documentary film of the 1966 World Cup in England. Actor Nigel Patrick’s voice can be heard in the song talking about ‘a beauty scored by Bobby Charlton’ and the famous ‘we want goals’ just before the rap. Polished, B-side remix done and other mixes complete (including the ‘No Alla Violenza’ version that would become the unlikeliest of anthems in gay clubs across Europe) the name ‘EnglandNewOrder’ was taken as a one-off and ‘World in Motion’ was complete. A reunion between Barnes, Allen and New Order took place at Liverpool’s training ground for his portion of the video to be shot. Typically things were loose on the day, Sumner drove to the shoot in a convertible car whilst wearing an Elvis jumpsuit as briefly glimpsed in the video “for a laugh”, and managed to first drive to the wrong football ground. Only Sumner (eventually) and Allen thought to wear an England shirt at any point in the process, Peter Hook opting for a light blue vest, Barnes wearing a red sweatshirt bearing the logo and name of his club’s sponsors Adidas rather than any concession to the national team’s kit or its manufacturer Umbro. On a beautifully sunny day a band famous for being cool and cutting edge sang the word ‘Ing-Ger-Land’ and danced awkwardly on camera with Barnes, who tried to keep a straight face while recording his solo in spite of Allen’s near-constant mischief. Further sections were shot with the squad at a later date but cleverly, the decision was taken to pick out Paul Gascoigne individually to ball juggle and mime along - a sign the FA knew they had both a marketable asset and a figurehead in the squad from the outset. The remaining gaps were plugged with pitch level footage from a recent friendly and World in Motion had been created, mixed and was a work of art. It now needed packaging and selling to a sceptical audience. On its launch the song was huge surprise to everyone expecting the usual paint-by-numbers affair. New Order had made a football song without a Faustian pact or a hint of irony. The John Barnes rap was so ripe for mockery but yet as playgrounds filled with the sound of children saying they ain’t no hooligans and this ain’t no football song, it was clear they had struck the perfect balance between taking themselves too seriously and slavishly finding a direct link to the game. Anthemic, uplifting, and perfectly suited to the needs of all involved, World in Motion was destined to become a huge hit. On its release on May 21st 1990, over two weeks before England’s first game against the Republic of Ireland, it went straight to the top of the chart and stayed there for three weeks. England’s players dutifully appeared via satellite link-up on Top of the Pops talking about the song, Gazza again chosen as one of those to speak now front and centre of anything FA related. A new summer of love was kicked off on the most positive of notes, Barnes and Gascoigne now recognisable to even those with no time for football. Free of bad language, an undertone of hooliganism or overly tribal sentiment, the song still has a huge crossover appeal to this day. New Order would go on to perform World in Motion to huge audiences, notably at the festivals in Reading and Glastonbury where they would be joined on stage by Allen who would take on the John Barnes role. The FA tried to plug into the mood of the nation in later years with efforts from the likes of the Spice Girls and Embrace, but despite a valiant effort from Baddiel and Skinner to date they’ve never got it quite as right as they did in 1990. Often imitated but never bettered it remains a miracle on many levels. Without David Bloomfield it may never have happened, without Tony Wilson it definitely wouldn’t. New Order provided a timeless song, Allen a mischievous link to the game. It then took John Barnes to provide the perfect finishing touch and we were left with a genuine genre-killing classic. Further reading can be found in interviews with various of the main players here, here and in their respective books and autobiographies, and if you can track down Issue 191 of Four Four Two for @nick_moore's excellent article about the day of recording. 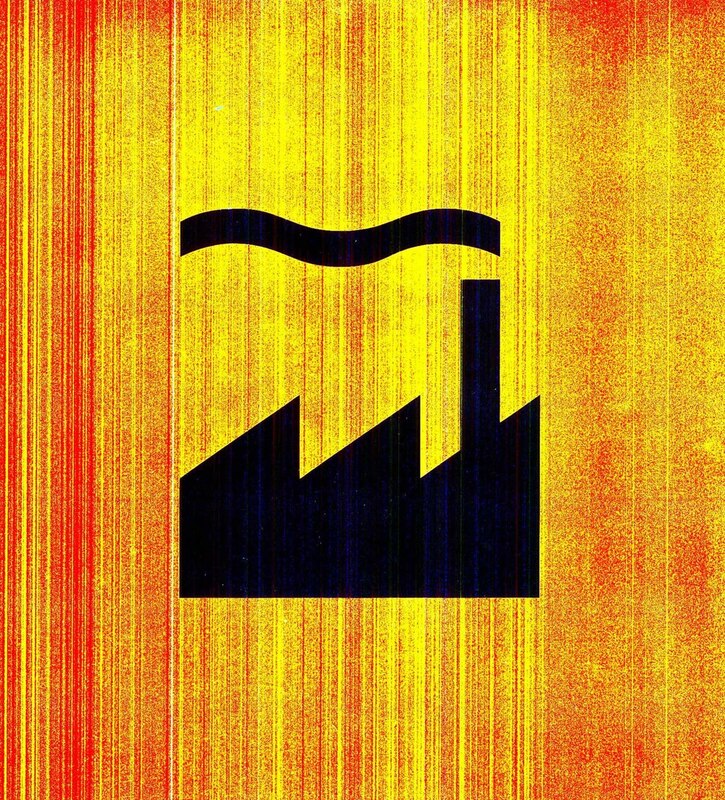 Original Factory Records logo by Peter Saville.